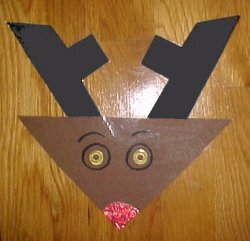 Pre-cut antlers for three year olds. Let four year olds cut out their own. Glue antlers to head. Add gold metallic reinforcements for eye pupils. With marker draw circles around reinforcements and add eyebrows. Put glue on nose and sprinkle with red glitter.